You are Lara Croft, a Tomb Raider. You are trying to uncover the secrets of the Sun Obelisk, an artifact supposedly worshipped in 15th century Peru. You believe you have finally found the location of the temple in which the Obelisk rests. Unfortunately, this information was stolen by a rival Tomb Raider, Damian Strathairn. Luckily, you made a copy of the information before hand. Now it's a race to see who can claim the prize! This game has both adult and non-adult versions. Play the non-adult version if you want to avoid the pornographic elements in the adult version. This is one of the ADRIFT Recommended Games put together in 2005 by the ADRIFT Forum. 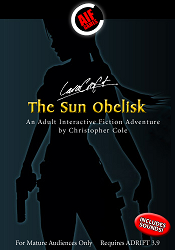 Lara Croft: The Sun Obelisk (Christopher Cole; 24-Nov-2002; ADRIFT 3.9). Erins 2003: Winner in 3 categories: Best Female Player Character (Lara Croft), Best Male Non-Player Character (Damian), and Best Female/Female Scene (Lara and Jade). Also finalist: 3rd Best Use of Multimedia. Download croft.zip from the author's site. Or download croft.zip from Shadow Vault. There is cover art available on the author's site: see front and back. Lara Croft: The Sun Obelisk (Christopher Cole; 10-Apr-2003; ADRIFT 3.9). Download croftnon.zip from the author's site. Or download croftnon.zip from Shadow Vault. Lara Croft: The Sun Obelisk - Reviews by various at delron.org.uk. Lara Croft: The Sun Obelisk - at IFReviews.org. Lara Croft: The Sun Obelisk (non-adult version) - at IFReviews.org. Lara Croft: The Sun Obelisk FAQ - by the author.